©Timothy J Chambers, Carnation Vase. Pastel on sanded Canson, 9.5 x 17.5 inches. Used with permission. His invitation was a work of art in itself because, he believed, an exhibition doesn't begin when you go to the opening, but when you receive the invitation. 2. Make it one of a kind. Your invitation will be extra special if you can make each invitation by hand: hand-printed, painted, or collaged. 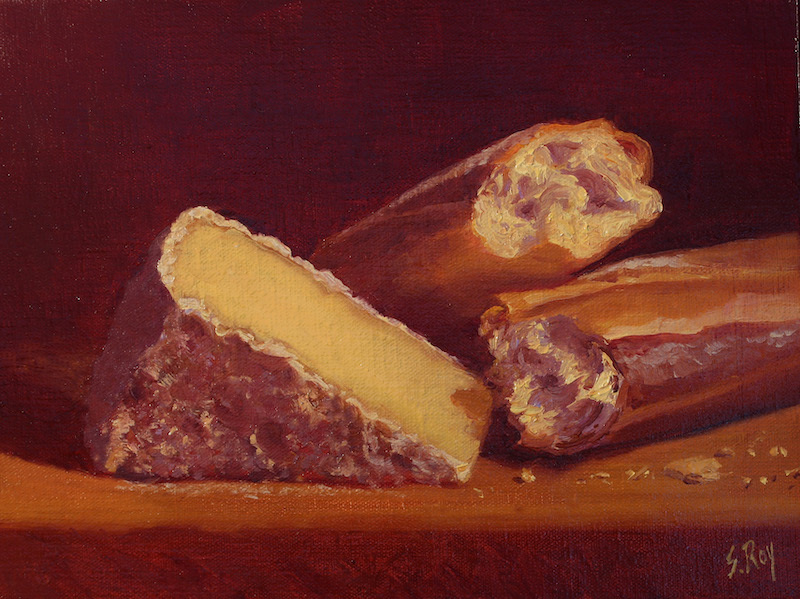 ©Simonne Roy, Baguette et Fromage. Oil on canvas panel, 6 x 8 inches. Used with permission. If you aren’t able to produce handmade invitations, get a professional to design them and use high-quality paper for the printing. 3. Focus on the art. Focus on the art. Focus on the art. This should be obvious, but take a clue from Mapplethorpe and hyper-focus the invitation on the art. He embossed a reproduced image from his show and reinforced the Polaroid theme in the invitation. Consider making an invitation that is a creative preview of the work people will see when they attend. ©Laura Hunt, Embrace. Mixed media/found object assemblage, 8.25 x 21 x 7 inches. Used with permission. 4. Don’t skimp on the envelopes. If you use a printing company, ask them to save their envelopes because they’re usually too flimsy to impress. You can catch someone’s eye without Tiffany envelopes, and you’ll pay significantly less than what Mapplethorpe shelled out for those back in 1973. Two of my favorite envelope resources are Envelopes.com and Paper Source. Your invitation shouldn’t look anything like the bills and junk mail landing in mailboxes. Swanky envelopes and hand embellishments will eliminate all possibility of that, and you can expand on this desire to stand out. Enclose your invitation in something with an odd shape. You can mail in square or clear envelopes, mailing tubes, and almost anything else you can dream up. Write a personal note by hand on the invitation and address the envelope by hand. Anything with your handwriting will get more attention. Even if you’re only sending a postcard, write a personal note somewhere on it. If the envelope or invitation is a dark color, I recommend the Uni-ball Signo broad white gel pen. I’ve tried my share of white pens and had almost given up on them before I came across this brand, which was a lifesaver for holiday cards. As I mentioned above, an email invitation will never have the gravitas as one delivered in real mail. However, because we use email so much, it’s important to be aware of how you can enhance the value of your email. 7. Send 1 email to 1 person. It’s easy to send an email to many people at once, but there’s not a whole lot that is special about those. If you want people to act, send a personal message to a single person. They’ll notice the difference. ©Renee St. Peter, Love-A-Fair. Watercolor on paper, 15 x 30 inches. Used with permission. Add a line or two (or more) that acknowledges the relationship you have with them. Tell them, with sincerity, how much it would mean to you if they would attend your show. Use a personal subject line such as I’d love it if you could come to my show. How do you use invitations to add cachet to your exhibition? This post was originally published on April 26, 2016. It has been updated with the original comments left intact. Hello what a timely note from you. I will have my first booth at an art show this weekend in Golden Colorado. I’m super excited. I hand-painted business cards to give out – which I’m really excited about. I’m also thinking of making bookmarks or postcards as well. I’m only selling originals so I’m looking for little things to handle people if they don’t buy. I’m not sure if I should just hand them out to everybody though. At least not till they spent some time looking around. Love the content that you share – thank you so much. Hi, Nikki! I’m here in Golden. Where is your show ??? Keep the special stuff for the special people. Love these ideas. I am wanting to have an art garden party and invite my neighborhood. Even the ones that I do not know. Doing something special like this would be perfect to get their attention! Thanks Alyson!! Great idea, Rebecca. And there’s so much you can do with a garden theme. Have fun with it. An excellent take on this and great timing for me. I always appreciate your newsletter and quick tips. Thanks Alison! Thanks, Kit. Always happy to see your name here. Also, kind of a bummer: I was going to pin from your site, but it won’t let me. Timely indeed! I have been invited to show almost all of my work from the last four years at what is – for where I live – a very prestigious gallery. It’s in a tourist town and in the summer so it will likely see a lot of traffic. I’m excited. But the gallery is creating the invitations and I am to use their invitations (they have a very specific contract)… it is a post card. They are always well done but still… what would you think of putting their post card in my envelope and adding a short handwritten note? Thank you for this wonderful article. I have always done this for my open studios every other year, but it is always gratifying to realize that one is doing it right. This year I have included a sheet with particulars about pricing, and also letting everybody know about the new directions in my work and asking for their ideas. I’ll have work by my students up, too. I love having the open studios; it’s so much fun seeing all the work up at once. And it is such a pleasure to see the friends who come and enjoy the work. Nice work, Lee. Keep it up. Great post, Alyson, and very timely! My solo exhibit opens in 2 weeks. I have taken a lot of care in designing my invitation to make it eye-popping and compelling. Clarity of information is also crucial so people who aren’t familiar with exhibit protocol understand that the show runs for a period of weeks AND that, additionally, there is an artist reception on a given evening. Again, thanks Alyson for your always-pertinent posts. Joy: Yay! They’re more valuable than ever. You’re so right Alyson. We’re artists so we’ve got no excuse to send out non-creative invitations. I like your idea of hand-made/embellished invitations. If we can’t send them to everyone we could send them to our most important people (collectors/mailing list) and use mass-printed ones to leave in venues etc. One technique I’ve used in the past when using mass-produced invitations is to use several different images – that way if I know someone personally, I can choose the one I think they’ll most like. Plus when people arrive clutching their invitations, they realise that they didn’t all get the same thing. Thanks, Alyson! I’ll definitely be using these tips for invites! What a useful and interesting ideas focused on invitations to shows…. when I think that I “have it” under control I read some of your articles with totally new and very useful advice. I will put in practice some of the points I have read here. I am having a big solo show in a prestigious art center, I want to do it well. Now that I think about it….I re married a couple of years ago and had a very lovely but small reception. I did all those invitations by hand. A simple but bright colored design they made an impact. For some reason never crossed my mind to use the idea for a show. So…. yes thanks again Alyson! This is such a timely blog post. I recently took studio space with two other artists in an old high school that has been converted into artist studios. We are planning our first Open Studio/Grand Opening this month and I’m very excited to show my work. Thank you so much for sharing your ideas. I am working on sending out my invitations by snail mail, adding a personal note and I love your idea to send a personal email. Thank you for your post. All the best. however I find this topic to be really something that I believe I would never understand. I am having a look ahead on your next post, I will try to get the hang of it! I’m curious about how to approach this for out of town shows. I’m showing in a variety of places where I haven’t lived and I don’t know anyone who lives near by. Can you talk about how to market myself for those types of shows? Simply amazing article! Has anyone ever wondered how to fill out forms online? I have, and found a simple service. I mostly use http://goo.gl/X4uJQt to edit my PDFs. I think it also allows you to to create fillable pdfs and esign them. I’m not having an exhibition yet, but many of these ideas could work for all kinds of events! Perfect timing Alyson. I’m just finishing invitations for my upcoming solo exhibition in June. Your suggestions are, as always, practical and well-considered. And I love the snail mail touch. As one of the last diehard fountainpen users, I’m inspired to make my invitations more personal. Fountain pens are, indeed, special. Lucky recipients. Timely post! I just sent image + information to gallery last night for upcoming show. the gallery has a standardized postcard invite and sends out near a thousand. Evon: So good to see you here. I’m glad you found this helpful. Thank you for pointing this simple truth out because I have installed 10 of my paintings in a Victorian bed and breakfast and they will be having a reception. I have several people I would love to send a personal invitation for the the opening and I now know that it should be very special since this is my first exhibition. It’s going to be lovely, Katherine! Thanks, Alyson! Finally have made efforts to contact and contract advertising services to get my brand out there. I always thought my work would draw enough attention to keep me in business…….. WRONG! There are so many talented artists out there cranking out high-quality art, that I realized I have to spend some money to get the word out. I’m much obliged to you! Thank you for the timely post, Alyson! I’m having my first open studio in a little over two weeks and just had a bunch of beautiful note cards printed—I’ve hand-addressed the envelopes and am going to write a personal message to each recipient. A quandary I have is how soon should I send these out? Two weeks before the event? A week before? I’m going to reinforce with individual emails and then, then week of, a couple Mailchimp blasts. I would appreciate your thoughts. Many thanks for your blog and workshops! Bonnie: I would send those now and use email as reminders. Alyson! Thank you so much for sharing Mapplethorp’s idea! I love the concept of the exhibition beginning when the invitation is received, not at the opening. Brilliant!!! You’re welcome. I love sharing great ideas! Timely, indeed! Great suggestions about personalization. My question is about a small foldable postcard catalog to send to collectors. I would like to design one myself. Do you know of any templates in regard to folding postcards (two folds, six images)? Cynthia: Confused about “postcard catalog.” What do you mean by this? Is it just 1 postcard that is folded? Alyson: I found one idea. All I had to do was search. Gotcha! So, the original paper is larger than a postcard. Thanks for this, Alyson, My curator/designer is working on invitations for my Dec. solo show at Miami Dade College. Her invitations are so beautiful that invitees actually frame them and hang them on their walls. The show is entitled Garden Party and the image is from my painting – a figure with a skirt made up of flowers so I am now thinking of a couple of dried real flower heads to put inside the invitation. Oh, that would be lovely, Susan! Great ideas! I realize I don’t have snail mail addresses for many of the people who come to my shows. Emails yes. I’ll have to try to collect home addresses because I love the REAL mail idea. As always, thank you Alyson! Geri: It’s worth reaching out and getting those addies. Thank you, Allison. Your ideas are always interesting. I just finished reading (every word) your 10th anniversary edition of IRBITS. It’s wonderful. I made lots and lots of notes. I’m trying to get the social media stuff organized before I leave on my May/June adventure from Montana to Missouri along the Oregon Trail, then back along the Missouri River. The work will be part of my August solo about homesteads and trails west at MonDak Heritage Center. Thank you again for the wonderful and updated book! Carol: Thank you for reading IRBITS! Your trip sounds amazing! I’ve printed up little note cards with my logo and contact information on them, and I hand-write personal notes on them to invite two kinds of special clients: the people who give me consistent interest and business, and the people who showed interest back in the very beginning, when I was first starting out on my own. The latter group may not be the biggest spenders, but they’re among my biggest supporters, and I value them tremendously. Thank you Alison , this page was so important and good to know it certainly would make a difference when sending invitations, Great tip and appreciated. What a beautiful and timely article! Thank you! There is a beautiful garden in my town and I would love to have my exhibit there. Hand written artsy invites would be perfect! Much love to you! I really enjoyed this article and I read it before my opening at Gallery One. Two blessings right there. I thank you. Yay! Hope you have a super successful show, TM. I have quite a large list of established clients, both email and snail mail addresses, but my problem is how to send snail mail to new people whom I have never met? Most offices ( like art centers, etc.) will not give you their list of home addresses. I have sold a lot of work over the years to my established base but now find that I need a new audience. I love your blog and have been a follower of your since early days!